The one-share, one-vote principle, commonly called regular votingThe principle of one share, one vote. Also called statutory voting. or statutory voting, is not required, and many US companies have restructured their voting rights in an effort to repel corporate raiders. For instance, a company might decide to issue both voting and nonvoting shares (as we discussed in Chapter 25 "Corporate Powers and Management"), with the voting shares going to insiders who thereby control the corporation. In response to these new corporate structures, the Securities and Exchange Commission (SEC) adopted a one-share, one-vote rule in 1988 that was designed to protect a shareholder’s right to vote. In 1990, however, a federal appeals court overturned the SEC rule on the grounds that voting rights are governed by state law rather than by federal law.Business Roundtable v. SEC, 905 F.2d 406 (D.C. Cir. 1990). While derivative actions are subject to abuse by plaintiffs’ attorneys seeking settlements that pay their fees, safeguards have been built into the law. At least ninety days before starting a derivative action, for instance, shareholders must demand in writing that the corporation take action. Shareholders may not commence derivative actions unless they were shareholders at the time of the wrongful act. Derivative actions may be dismissed if disinterested directors decide that the proceeding is not in the best interests of the corporation. (A disinterested directorA director who has no interest in the disputed transaction. is a director who has no interest in the disputed transaction.) Derivative actions are discussed further in Chapter 25 "Corporate Powers and Management". Two main fiduciary duties apply to both directors and officers: one is a duty of loyalty, the other the duty of care. These duties arise from responsibilities placed upon directors and officers because of their positions within the corporation. The requirements under these duties have been refined over time. Courts and legislatures have both narrowed the duties by defining what is or is not a breach of each duty and have also expanded their scope. Courts have further refined the duties, such as laying out tests such as in the Caremark case, outlined in Section 25.4.3 "Duty of Care". Additionally, other duties have been developed, such as the duties of good faith and candor. As a fiduciary of the corporation, the director owes his primary loyalty to the corporation and its stockholders, as do the officers and majority shareholders. This responsibility is called the duty of loyaltyFiduciary obligation requiring loyalty of directors and officers to the corporation and its shareholders.. When there is a conflict between a director’s personal interest and the interest of the corporation, he is legally bound to put the corporation’s interest above his own. This duty was mentioned in Exercise 3 of Section 25.2 "Rights of Shareholders" when Ted usurped a corporate opportunity and will be discussed later in this section. 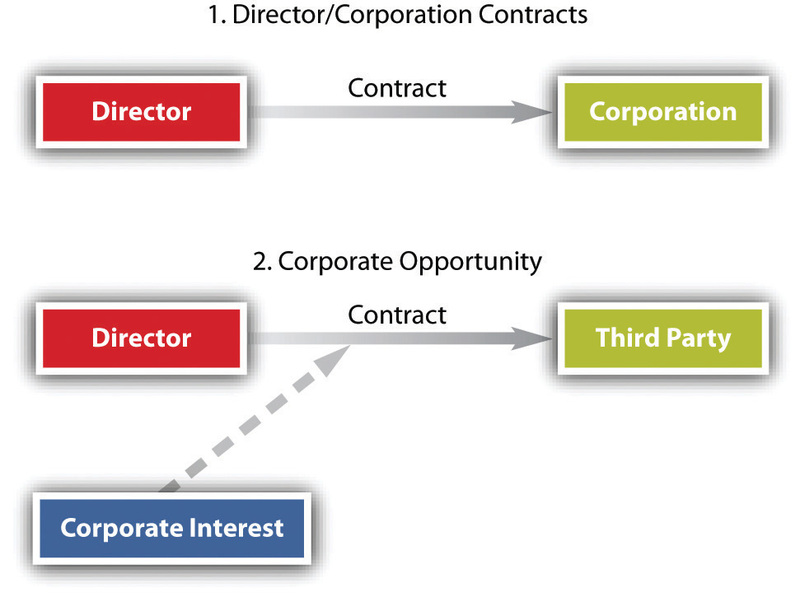 Two situations commonly give rise to the director or officer’s duty of loyalty: (1) contracts with the corporation and (2) corporate opportunity (see Figure 25.3 "Common Conflict Situations"). Despite the fiduciary requirements, in reality a director does not spend all his time on corporate affairs, is not omnipotent, and must be permitted to rely on the word of others. Nor can directors be infallible in making decisions. Managers work in a business environment, in which risk is a substantial factor. No decision, no matter how rigorously debated, is guaranteed. Accordingly, courts will not second-guess decisions made on the basis of good-faith judgment and due care. This is the business judgment rulePresumption given by the courts to corporate directors that their actions were informed and done with good faith and with an honest belief that the actions were in the best interests of the corporation., mentioned in previous chapters. The business judgment rule was coming into prominence as early as 1919 in Dodge v. Ford, discussed in Chapter 24 "Legal Aspects of Corporate Finance". It has been a pillar of corporate law ever since. As described by the Delaware Supreme Court: “The business judgment rule is an acknowledgment of the managerial prerogatives of Delaware directors.…It is a presumption that in making a business decision the directors of a corporation acted on an informed basis, in good faith and in the honest belief that the action taken was in the best interests of the company.”Aronson v. Lewis, 473 A.2d 805, 812 (Del. 1984). If a shareholder is not pleased by a director’s decision, that shareholder may file a derivative suit. The derivative suit may be filed by a shareholder on behalf of the corporation against directors or officers of the corporation, alleging breach of their fiduciary obligations. However, a shareholder, as a prerequisite to filing a derivative action, must first demand that the board of directors take action, as the actual party in interest is the corporation, not the shareholder (meaning that if the shareholder is victorious in the lawsuit, it is actually the corporation that “wins”). If the board refuses, is its decision protected by the business judgment rule? The general rule is that the board may refuse to file a derivative suit and will be protected by the business judgment rule. And even when a derivative suit is filed, directors can be protected by the business judgment rule for decisions even the judge considers to have been poorly made. See In re The Walt Disney Co. Derivative Litigation, (see Section 25.5.2 "Business Judgment Rule"). Whether or not they have the power to indemnify, corporations may purchase liability insurance for directors, officers, and employees (for directors and officers, the insurance is commonly referred to as D&O insurance). But insurance policies do not cover every act. Most exclude “willful negligence” and criminal conduct in which intent is a necessary element of proof. Furthermore, the cost of liability insurance has increased dramatically in recent years, causing some companies to cancel their coverage. This, in turn, jeopardizes the recent movement toward outside directors because many directors might prefer to leave or decline to serve on boards that have inadequate liability coverage. As a result, most states have enacted legislation that allows a corporation, through a charter amendment approved by shareholders, to limit the personal liability of its outside directors for failing to exercise due care. In 1990, Section 2.02 of the RMBCA was amended to provide that the articles of incorporation may include “a provision eliminating or limiting the liability of a director to the corporation or its shareholders for money damages.…” This section includes certain exceptions; for example, the articles may not limit liability for intentional violations of criminal law. Delaware Code Section 102(b)(7), as mentioned previously, was enacted after Smith v. Van Gorkom (discussed in Section 25.4.3 "Duty of Care") and was prompted by an outcry about the court’s decision. As a result, many corporations now use similar provisions to limit director liability. For example, Delaware and California permit the limitation or abolition of liability for director’s breach of the duty of care except in instances of fraud, bad faith, or willful misconduct.